The gallery offers guided tours with a cultural and historical point of view for private groups, art enthusiasts, school classes, associations and its like, in the district Friedrichshain, Berlin. Despite the fact that the Berlin Wall fell in 1989, it is still clear what is east and what is west in the cityscape. 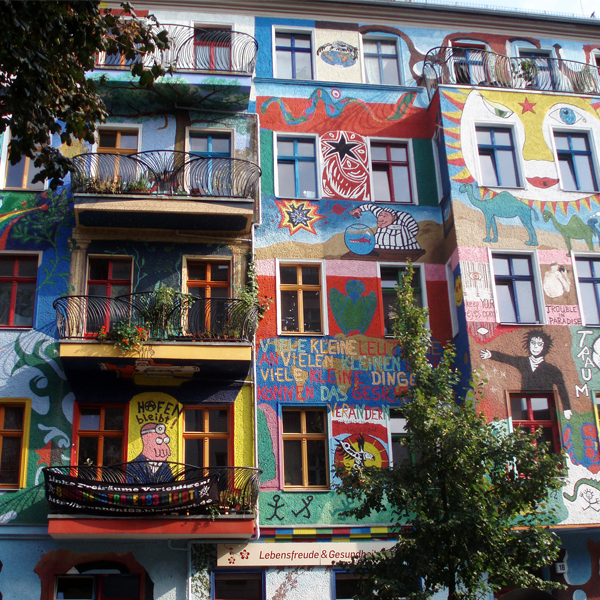 Friedrichshain is a very good example to this as the neighborhood is still characterized by having been on the eastern side. This makes it a remarkable district to walk around in with both classic architecture and curiosities reflecting the colorful neighborhood and spots untouched by the “western way of thinking”. The guided tours are intended for everyone; those who have been in Berlin several times and those who have never visited the city before and will be customized based on the interests of the group getting the tour. The tours are suitable for both small and larger groups. Typically, the gallery makes reservations at one on of the local restaurants for dinner or lunch on behalf of the group. The total price for a guided tour and lunch/dinner will normally not exceed 25 euro per person. – Architecture in the area including house facades and the like. ”It was possible to ask questions, both in the gallery and on the tour which made it really intimate and comfortable. There was a lot of information about the time before the wall came down which we could not get from the guidebooks and that made it really interesting!”Group of friends from Copenhagen. A group of 40 from the company CLAVIS. – Visiting different artists (only by appointment). – The district’s identity and history as well as meetings with other young people from the neighborhood. Suitable for groups of 20 – 40 people. The price for a guided tour is 10 euro per person (minimum 10 persons). The guided tours are only offered for between 10 and 40 people and the duration is between 1-3 hours. In der Galleri Heike Arndt Berlin können Sie jetzt Führungen mit dem Thema Kunst und DDR-Geschichten erleben – in Zusammenarbeit mit dem Jugend(Widerstands)museum! Friedrichshain hat eine lange Tradition als Ort des zivilen Widerstands und des Ungehorsams gegen Unterdrückung und Einschränkung der Freiheit. Mit der Eröffnung der Dauerausstellung „Warten Sie nicht auf bessere Zeiten“ hat die Hedwig-Wachenheim-Gesellschaft e.V. die Galiläakirche zu einem Ort gemacht, an dem der Jugendwiderstand in der DDR dauerhaft dokumentiert wird. Vor allem junge Menschen sind eingeladen, sich mit der DDR-Geschichte auseinanderzusetzen. Kontaktieren Sie uns, um eine Führung für 10-120 Personen zu buchen!